Get your stretchy pants on because you’re going to want seconds and thirds of this dish. Our post today is from Olivia of Olivia’s Cuisine. I was so glad when she wanted to participate and chose Syria as where to make a dish from. Syrian food is amazing! 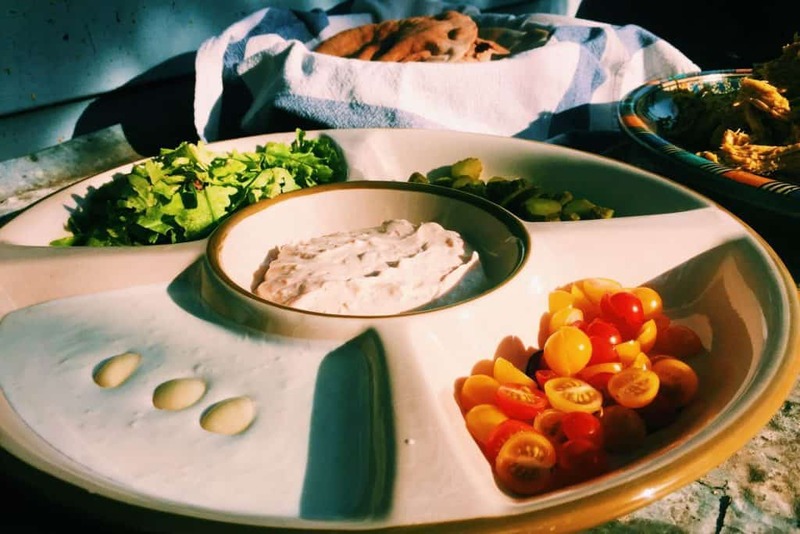 You can find more great recipes from Olivia on her blog and be sure to follow her on Facebook, Twitter and Instagram. I have this obsession with Middle Eastern food. My American friends can’t understand where it comes from, since I’m Brazilian and they think that in Brazil all we eat is feijoada and pão de queijo while drinking caipirinhas at the beach. Oooh, but they’re so wrong! São Paulo, my hometown, has a huge Lebanese and Syrian community, so I grew up eating Middle Eastern food. Kibbeh, Sfihas (that’s how we call those little meat pies), Baklava, Tabbouleh, Hummus, Baba Ghanoush, you name it, we have it! It is a huge part of our culture! We even have drive-thru Lebanese fast food restaurants! Shockers, I know! So imagine my excitement when Amanda told me she was gathering bloggers to work on this Middle Eastern/Islamic food project for Ramadan! I immediately volunteered and chose Syria, as I am somewhat familiar with this country’s cuisine. However, I decided to try my hand at a dish I had never made (or eaten) before and, after a little research, my mind was set on this delicious Fattet Djaj! 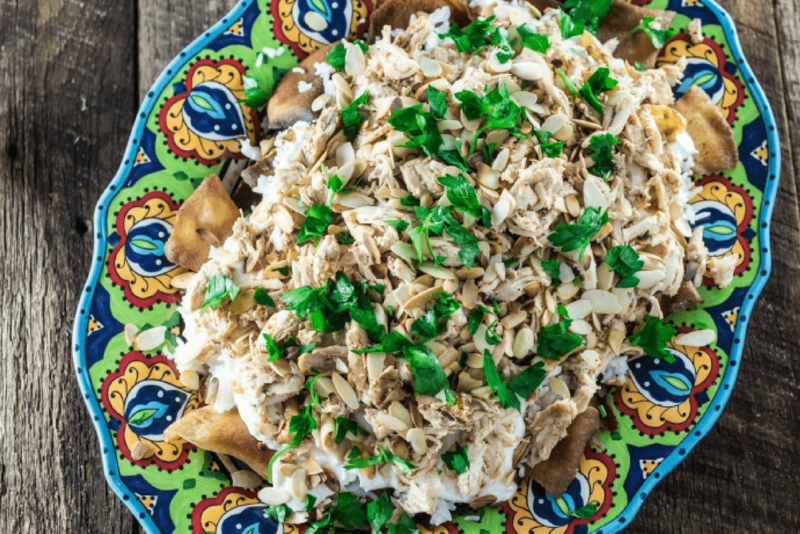 The Fattet Djaj (or Fatti Dajaj) is a layered chicken platter that consists of fried (or toasted) pita bread, rice and chicken with a delicious garlic-yogurt-lime sauce and topped with some toasted nuts. It’s pretty much a medley of some of my favorite flavors and textures! Seriously, what could be better than that? The recipe is pretty simple and has a few shortcuts you could take. I highly recommend using a rotisserie chicken if you wanna make this in less than 30 minutes and skip the whole order of roasting a chicken! You could also use leftover rice and even store-bought pita chips. I did make fresh rice and fried my own pita chips, though, and they came out a-ma-zing and super crispy! The secret here is to have your chicken and your rice warm when you start assembling the platter. The yogurt sauce should be cold or at room temperature, never hot. And once you assemble the platter, you cannot heat it up, so I recommend serving right away, unless you don’t mind cold or room temperature food. I have this aversion to cold food (unless it’s salad) and my dish was cold after I finished photographing it. However, I did eat it and it was delicious nevertheless. I found many different ways to make this recipe, and ended up combining a few. Some recipes will ask you to bathe the pita chips with chicken broth and lemon juice. I didn’t do that, as I like the idea of a crunchy texture to balance the softness of the other ingredients. You can serve this dish as an appetizer, as it is usually served in Syria, or as a main dish! It serves 6 people comfortably, maybe more as an appetizer. – Loosen up the yogurt sauce with some chicken broth or use a non-Greek yogurt variety. I would like it to be more saucy and not too thick. – Eat it right away (instead of photographing it for half an hour) so I can enjoy this dish warm. I did try to heat some leftovers in the microwave and it just doesn’t taste the same. There’s something about warm yogurt sauce that makes me wanna run for the hills! – I might add the yogurt sauce after I add the chicken. Just for aesthetic purposes… Also, maybe I’ll layer just half of the yogurt sauce and serve the rest on the side. But that’s just me being picky and wanting everything to look as if they were made for the Saveur magazine! Other than that, I wouldn’t change a thing. 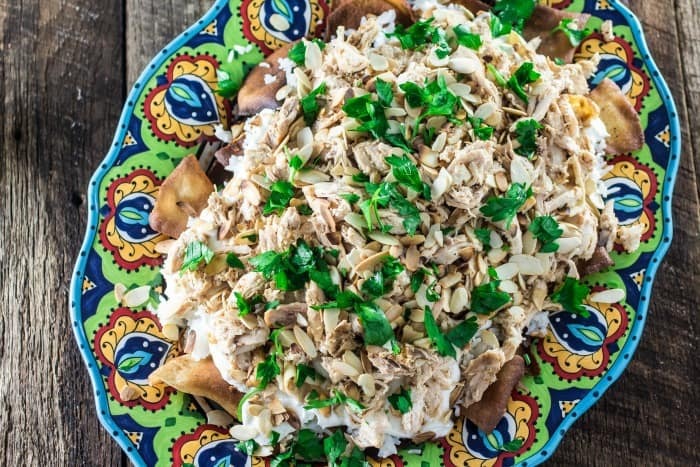 The flavors in this Fatteh Djaj were amazing and me and my husband devoured the whole thing by ourselves (not all at once, obviously!). 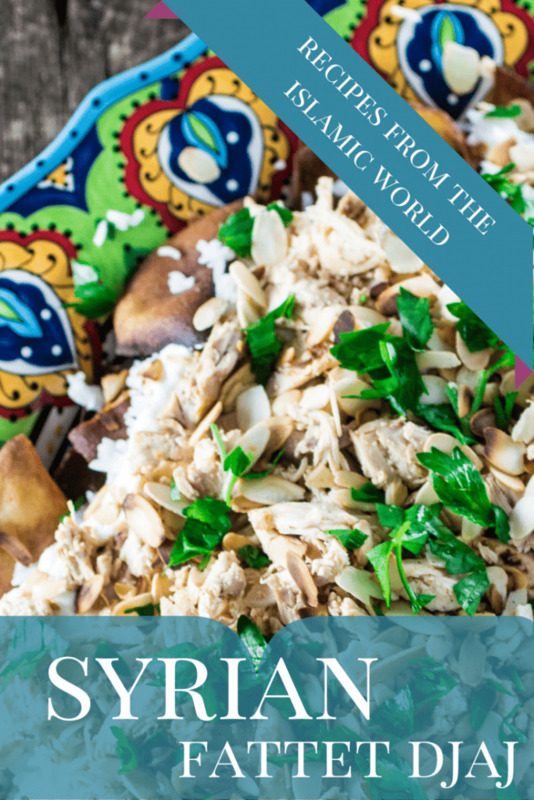 I hope I have succeeded in inspiring you guys to explore a little of the Syrian cuisine! And Happy Ramadan! Start by heating the vegetable oil, over medium heat, and frying the pita squares (stale works better than fresh) until golden and crispy. Transfer to a plate lined with paper towel to soak the extra grease. Reserve. Make sure your shredded chicken and rice are warm before assembling the Fattet Djaj and work quickly so everything is still warm when you serve it. In a big casserole or serving platter, start with the pita squares, evenly distributed in a single layer. The next layer is the rice and finally 2/3 of the chicken mixture. 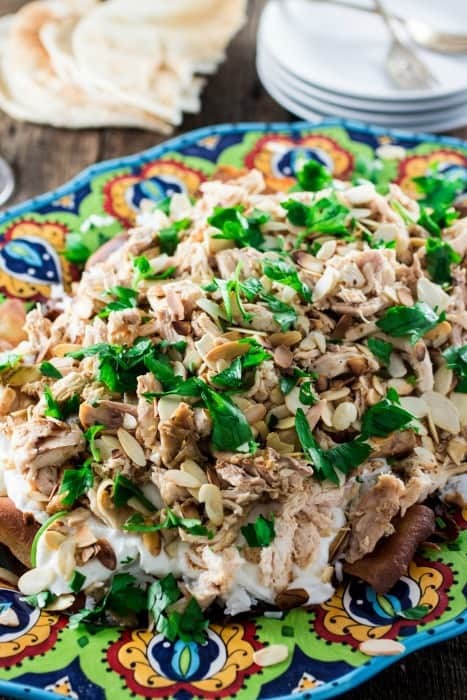 Top with the yogurt sauce and the remaining chicken and finish by sprinkling the toasted nuts, the chopped parsley and the cinnamon (if using). You can also sprinkle some freshly cracked black pepper on top of everything. Today’s post is from Aysh of JeddahMom. 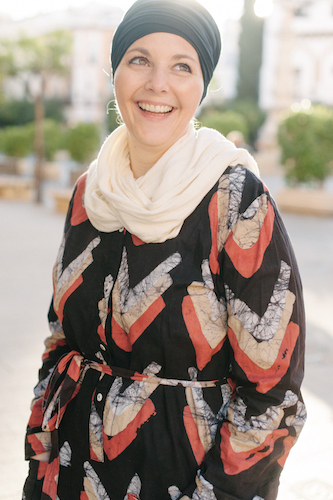 She currently lives in Saudi Arabia and shares all about her multicultural life and crafting passions on her site. Her story of learning this recipe reminded me a lot of my first experiences with Moroccan cooking. While the ingredient list and multiple steps in this kabsa recipe might look intimidating they lead to a tasty and impressive result. You can follow Aysh on her website, Facebook, Twitter and Pinterest. Enjoy! Hi! I am Aysh from JeddahMom. I am an Indian expat living in Saudi Arabia. 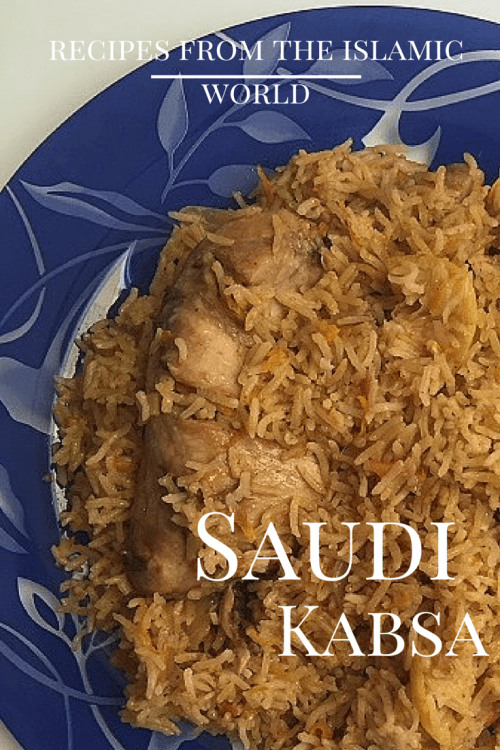 Today, I am sharing with you Kabsa, a traditional Saudi dish. Kabsa is a chicken and rice main course dish that is popular not just in Saudi Arabia but across the Arab world. When I first moved to Riyadh in 2005, I was just married and knew nobody there except my sister in law. Coincidently, it was Ramadan then too. We would often go to the Salam Park in the evening to break our fast and play badmintin before Iftaar. Kabsa is one of those dishes that I learnt then. This recipe that I am sharing is how my sister in law taught me and it is by far the tastiest Kabsa I have tasted. Kabsa is made of chicken that is slowly simmered in a spicy broth of tomatoes and spices. This chicken is then removed and either fried or grilled while the broth is used to cook the rice. The result is a mouth-watering aromatic dish which smells lemony and spicy. The rice absorbs the juices from the chicken and vegetables and is moist. The chicken is cooked till just tenderness and then steamed with the rice so it is all in one with the rice when you serve it out. My family loves Kabsa. My seven year old has tried it a few times and he often remarks that he can eat it every day! Since I don’t add too much chilli, my two year old and one year old eat it too. I have found that they eat quite well actually. It is a fantastic way to sneak in the veggies. There are quite a few variations to how Kabsa is made. Most Arab ladies have their own family recipe. This recipe that I am sharing today is how my sister in law makes it. She learnt it from a Saudi neighbour. I like the taste of fresh lemon compared to the dried lime or Lomi (as it is locally called). Lomi has a different taste and smell. I also like the chicken to be steamed with the rice rather than placed on top of a bed of rice. Kabsa is a chicken and rice main course dish that is popular not just in Saudi Arabia but across the Arab world. You will need to use a large pot that can accommodate the chicken pieces well. Start by heating the oil in the pan. Add the whole spices (cinnamon, cardamom, black pepper and cloves) and let them splutter before you add the onions. Fry the onions on medium high till they are golden. Add the ginger and garlic paste and fry a little before you add the tomatoes, tomato paste and the powdered spices. Keep stirring and fry till the tomatoes are all mushy and the oil starts to separate. Add the chicken pieces and some salt. Saute the chicken on high heat till the oil separates again. Add 4 cups of water and reduce heat when it starts to simmer. Reduce heat and let this cook till the chicken pieces are tender. Usually it takes about 15-20 minutes on medium low heat. Wash and soak the rice while the chicken cooks. Once the chicken is done, with a slotted spoon remove the chicken pieces on to a dish and cover with foil. Measure the broth. For every cup of rice that you are using, you will need one and a half cup of water. If the broth is not enough then you can add some water to make it equal to what you need. Start the heat again. Add the grated carrots and sliced lemon to the broth. When the water starts to boil, add the drained rice to it. Check and adjust the salt. Let it cook on medium high till the water reduces and it becomes difficult to stir. If you want the chicken in the rice then now is the time to add them. Remove the skin first and then drop them in to the rice and stir it. Close the lid tighly, reduce the heat to the lowest and let it steam for 15-20 minutes. If you are not adding the chicken to the rice but would like it grilled or fried then you can proceed to steaming without the chicken. To grill the chicken, just brush it will oil and place it in the oven for 5- 10 minutes. You can fry it hot oil too to get a golden crispy texture to it too. You can fry the raisins and pinenuts in a little butter and oil in the meanwhile and pour this on the rice for garnishing. After the steam escapes, serve the rice with the chicken. Please Note: The chicken will be cooked with the skin on to keep it moist. You can removed the skin before steaming with the rice. If you choose to grill or fry the chicken pieces then the skin helps give it a crispy outer layer. You can wash and make slits in the chicken before hand. Rub in a little salt and garlic-ginger paste too. This helps the chicken absorb the juices well. You can serve it as it is with a fresh salad or with a bowl of hot fresh tomato sauce (tomato and green chillies blended). Enjoy! Want more great Saudi dishes? 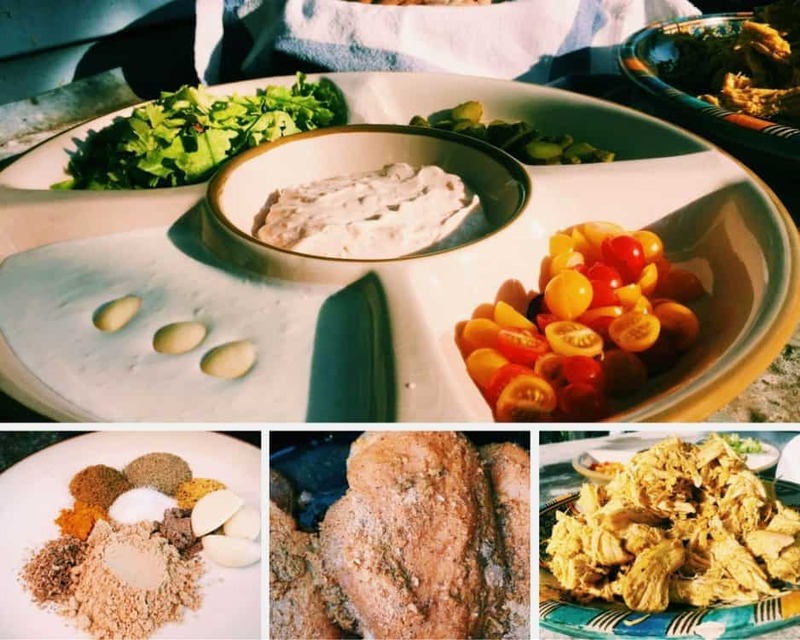 Aysh has a post on 5 Recipes from Saudi Arabia you should check out. 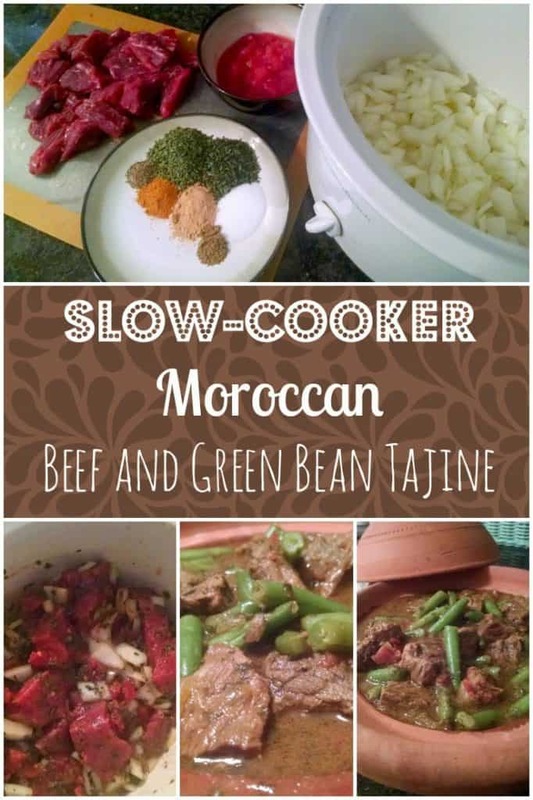 It’s been a long time since I’ve blogged a tajine recipe. You see it’s not intentional but you may be surprised to know I don’t do a lot of our main meal cooking – especially when it comes to Moroccan food. My sister-in-law who happens to be an amazing cook handles the lunch time meal. So unless we want something that’s not Moroccan, I let her take care of things. But, you see, we had a little “issue” a few weeks ago. Most of my days I spend working. But, I work from home so it’s not always apparent that I’m “working” – because I’m always here and I might do other things when I take breaks. So, the other day my mother in law commented on my not cooking (not in a bad way). Truth be told I feel like my tajines don’t hold a candle to theirs. I know that I can hold my own but it’s just a personal flaw of mine. They’d eaten the whole thing; and my mother in law? She gave it 2 thumbs up. This is best prepared in a tajine but if you don’t have one, a heavy bottomed pot will work too. In a bowl combine olive oil, cumin, cinnamon, ginger, crushed garlic, saffron, salt, and pepper. 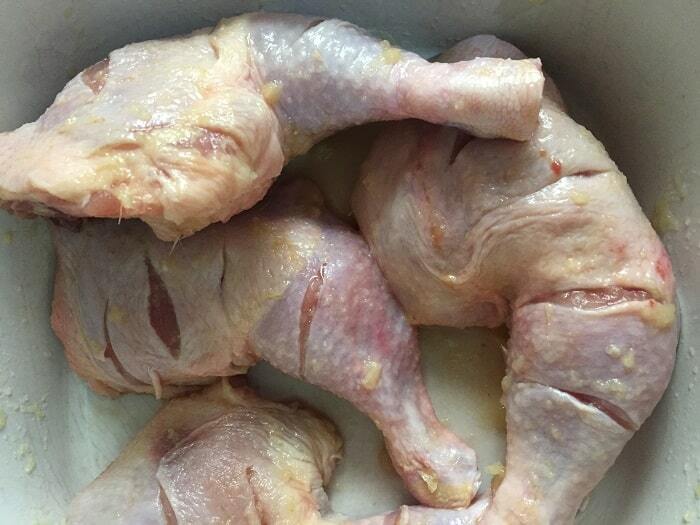 Wash chicken well and remove any excess fat – but leave skin on. 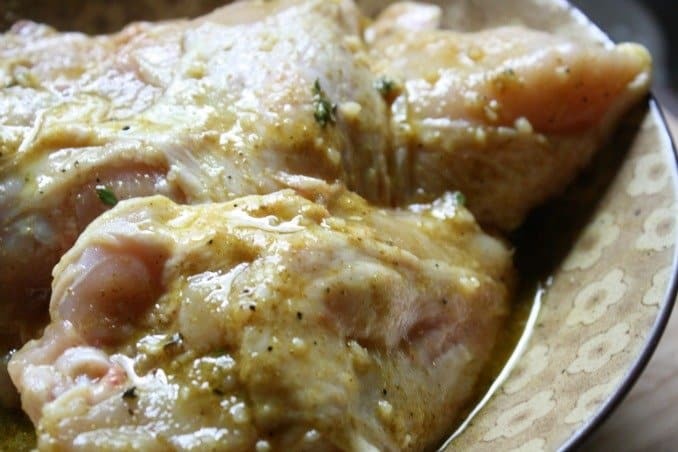 Coat chicken in marinade and refrigerate while preparing the rest of the meal. Slice one onion in half, remove skin and slice into pieces as thin as possible. In the bottom of a tajine or pan add 1 Tbsp butter and 1 Tbsp of oil. Turn heat on to low, and add onions. Saute until onions become soft and start to brown. Prepare tomatoes by either grating the insides into a bowl, or blanch in boiling water, and remove skins. Chop into small pieces and add to the onions. Make space in the tomatoes to add the chicken pieces, skin side down. 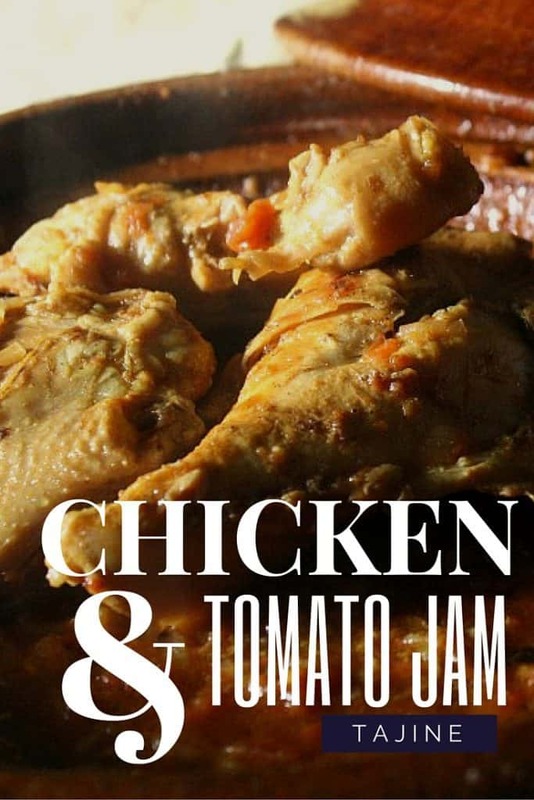 The chicken should be nestled into the tomatoes. Add the cover to the tajine or pot and allow to cook for 45 minutes – 1 hour until the chicken is cooked through and falling apart and liquid has reduced in the pot. Mix in a teaspoon of honey at the very end and allow for a few more minutes of cooking. You can also top with sesame seeds right before serving. Eat hot with crusty Moroccan bread. 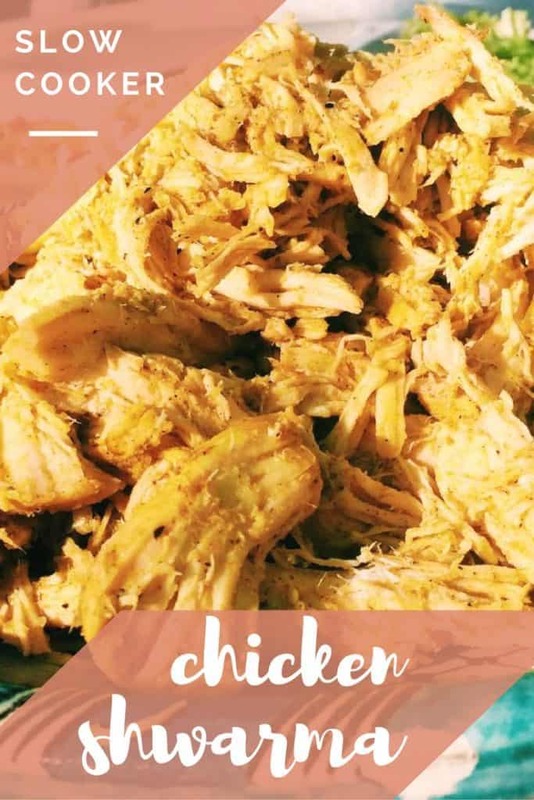 **To make cooking even faster, marinade the chicken the night before, slice onions and place in a container, and grate/blanch tomatoes and add to a container. When it’s time to cook just pull everything out and follow the cooking steps. This weekend is considered the start of summer in the United States. So, it makes sense that the theme for this weeks’ Sunday Supper is Picnics. It seems like we missed spring and are jumping right into summer considering we’ve only been without snow on the ground the last three weeks. I however, am not sad about this. I love summer and am welcoming it with open arms. One of my favorite picnic foods is fried chicken. It’s great when served fresh and hot but it’s equally good when it’s just room temperature eaten with your fingers while spread out on a giant blanket. 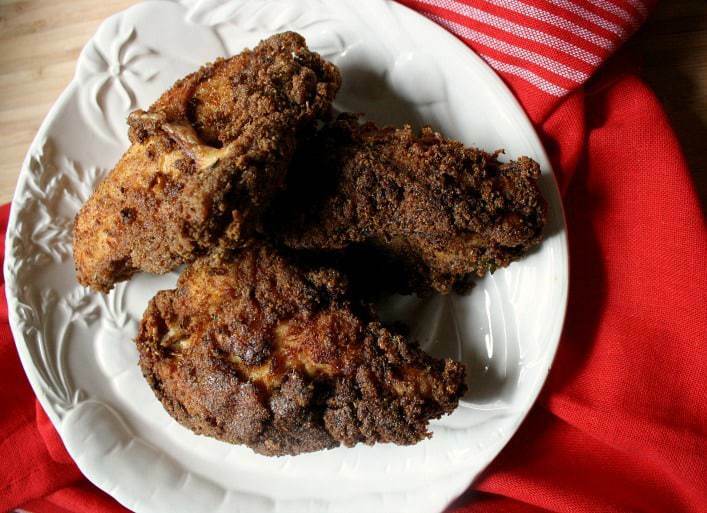 For my recipe this week, I decided to put a twist on traditional American fried chicken. I made mine gluten-free by using a gluten-free breading mix but if gluten isn’t an issue for you, traditional breading such as bread or panko crumbs is just fine. 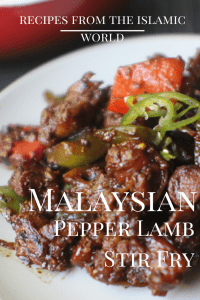 This isn’t a dish you’re likely to find served in a Moroccan home but the flavors remind me of djej m’hammar, a tajine that’s cooked and then the meat is quickly fried to crisp up the outside before serving. 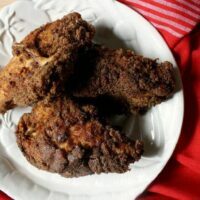 I will have to share that recipe soon, it’s a favorite in our house and judging by my family’s response to this fried chicken it will also be joining our regular line up! Make your fried chicken with a little extra Moroccan inspiration! Wash and trim chicken of excess fat. Leave some skin on the meat and place in a large bowl. In a smaller bowl combine garlic, onion powder, turmeric, cumin, ginger, and lemon zest. Slowly add olive oil and mix the spices until a thin paste has been created. Pour the marinade on top of the chicken and rub each piece of meat with the marinade. Make sure to place marinade under the skin. Refrigerate for up to 24 hours, but at least 1 hour. When you are ready to cook the chicken, add enough vegetable oil to a pot so that the chicken pieces will be covered completely. Heat the oil to medium-high. While the oil is heating, bread the pieces of chicken by removing from the bowl and coating with breading. Once the oil is heated, cook the chicken 1-2 pieces at a time. Do not crowd the pan. It will take between 15-20 minutes for the chicken to cook through. When it is cooked, remove from the oil and place onto a towel to remove any excess oil. One of my first “homemade” Moroccan meals (before that time I had eaten in Moroccan tourist restaurants that were bad!) was a roast chicken stuffed with spices and vermicelli noodles. To this day it still is one of my favorite things. Unlike many Middle Eastern cultures Moroccans don’t have a big tradition of stuffing things. Things like stuffed grape leaves, kibbeh, and other stuffed vegetables that are common in the Levant are just not part of the repatoire in Morocco. What was interesting as I began this exploration of Moroccan Jewish food is that stuffing food is more common than with the Arab dishes. This might be part of historical culture or just what was passed on. I don’t really know. As you’ll see later this week with dafina, the idea of stuffing exists with that recipe as well. I cooked this dish on Sunday when we were being blanketed with nearly a foot of snow. Everyone was stuck inside and it made perfect sense to me to turn the oven on for a roast chicken. I found this idea in the cookbook I mentioned in my introductory post but strayed from some of the steps and ingredients to fit what I had on hand. The one thing I did discover in creating this recipe was my love for tarragon. Seriously where have you been all my life?!?! I’m so excited to experiment with this herb. One other note, I made this gluten free. The original recipe calls for matzo and bread crumbs – you can of course use either or both. I however used Glutino gluten-free table crackers for the stuffing. They resembled the taste of matzo very closely even though I was expecting something closer to a saltine when I bought the package. My take on a roast chicken with almonds and matzo stuffing. A play on Thanksgiving flavors and Moroccan Jewish cuisine. Wash and clean the chicken very well, taking extra care to clean out the cavity. Do not remove the skin! Peel the carrots, garlic, onion, and apple, and egg and roughly chop all of them. In a food processor add all of the above plus the almonds, tarragon, salt and basil and pulse until broken down. You can blend them until they are completely broken apart or leave in larger chunks. Pour the ground matzo into a large bowl. Combine the mixture from the food processor to the matzo and stir to incorporate. Break the egg and mix it into the stuffing. Cut the 1/2 stick of butter into small cubes and gently mix with the stuffing. Place the chicken into a roasting pan. If you don't have a roasting pan, I found that using a large oven proof pot works just as well. Gently separate the skin of the chicken from the flesh. Begin stuffing by adding a layer of stuffing between the skin and flesh. Smooth out as much as possible. Do this in as many places as possible. Add the remaining stuffing to the interior cavity of the chicken. Pour the 3/4 cup of chicken broth into the pot/pan. Slide the pot/pan into the preheated oven and bake for 60-90 minutes. The baking time is going to depend on how large your chicken is. You want the juice to run clear and for there to be no pinkness in the meat. The outside of the skin should be brown and crisp and the interior juicy. Serve hot with a side salad and/or potatoes. There’s a lot of slow cooker soup recipes. If I served soup as a meal I’d get a lot of sad faces. Lots of freezer meals include pasta, something we eat very little of. Pork, lots and lots of pork. 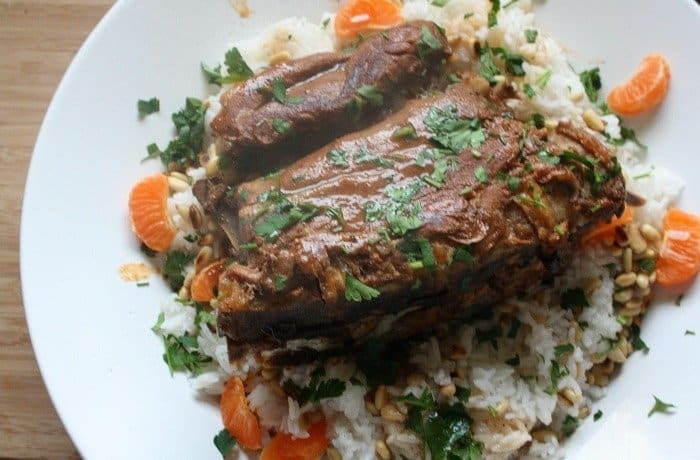 There are some Moroccan tajines that I’ve tried in the slow cooker and while the taste is ok, the sauce doesn’t reduce and have the same flavor. I’ve always wanted to take Middle Eastern and Moroccan recipes and make them even easier. Traditionally the chicken in a shwarma sandwich is spit roasted and shaved to fill a sandwich. I have neither a spit nor the patience to slow roast and shave it. 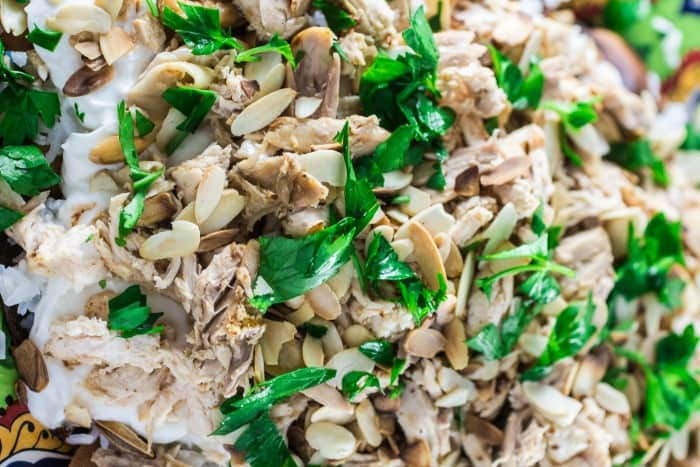 Shwarma in the slow cooker is delicious and won’t make you sweat all day tending the spit. The flavors of chicken shwarma without the need of a roasting spit. Make it in your slow cooker or instapot. 1. Trim chicken breasts of any excess fat. Place in a bowl and add the sumac, salt and pepper garlic, turmeric, coriander, cumin, ginger, cardamom and chili pepper (optional). 2. In the bottom of your slow cooker add the vegetable oil and add the chicken. 3. Pour the lemon juice on top and add enough water to almost cover the chicken. 5. A few minutes before eating, transfer the chicken and liquid to a large pan. Shred the chicken with forks, and turn the heat to high. 6. Watch the chicken as the liquid reduces. You will want all of the liquid to be reduced, and the chicken to just slightly begin drying up. At this point it's done. Serve the shwarma in warm pita bread (you can also try this fantastic recipe for gluten free wrap bread I found!) Condiments you may want to also include are Arabic garlic mayo, lettuce, tomatoes, pickles and other mezze style dips. I made this for a get together over the summer and served it with my super fast version of Arabic garlic mayo. The traditional version is a slow process of emulsifying whole garlic cloves with olive oil. Not many of us have time for that. So instead make it this way. Whisk it all together. You can add more garlic if you’d like, or less but this should have a strong garlic taste. If you’d like it thinner use olive oil to get the consistency where you’d like it. 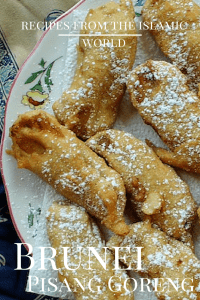 I hope you’ll love this recipe as much as my family did! I have since made this for a few different times for events and gotten feedback from others who LOVE this recipe. Make it tonight! PS if you’re looking for a good machine I love this one that is a slow cooker and pressure cooker in one.